Well this is interesting (told you there’s bound to be something like that everyday). My cousin Miel and my friend Presea both asked if I did any work for PLDT. Apparently, there’s an ad on the Inquirer today featuring two comic strips about life and the Internet. The artist’s name is Kat Sales. I went through a mental inventory of work I did, and of everything, the only comic strip I ever remember doing that’s published online is this and this. It doesn’t sound like what Presea described, so I don’t think PLDT lifted it or anything. I don’t even remember doing work for anyone recently. I wish though. The extra money would be nice. Here’s the drawings. Photos were taken by my cousin. Maybe you can contact her through PLDT? Naks Kat, meh tukayo ka pala. At artist din! There's another one. 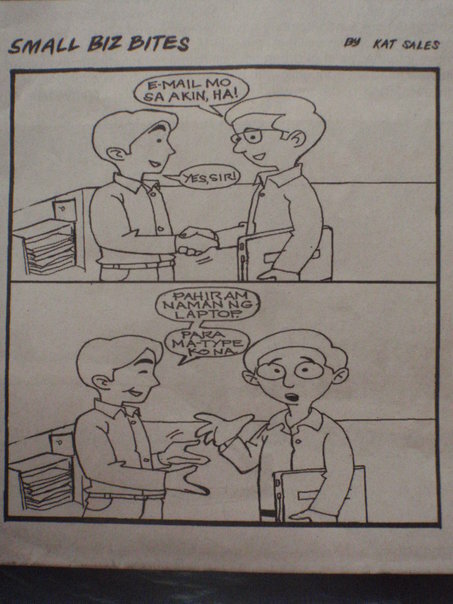 I think this person is doing a comic strip for The Philippine Star. Although when I look at it, it looks different.Thet, hindi sa nagbubuhat ako ng sariling banko, pero oo, I agree with you haha.